Elastic Search for Magento 2 is an advanced solution which provides your store with highly accurate, fast and flexible search. Developed in Java, Elasticsearch is an open-source search/analytics engine that suggests more precise results for more queries. The integrated solution is apt to deliver scalable real-time search and work with facetting and multitenancy. The stack of technologies comprises autocomplete search, autocorrection for misspelled words, synonym results, a full-text search involving all your site content and more. We’ve gone beyond that and made it more flexible. Our add-on works w/t Elasticsearch 6+ and comprises wildcard partial/fallback search, error tolerance, search query, out-of-stock items hiding, and more useful options. Why use Elasticsearch with Magento 2? Since 2010, Elasticsearch is known as a powerful tool for search and logging. Why do merchants choose it? Firstly, they do this for better search. When searching a lot of text common relational database management systems (RDBMS) don't do well because of the lack of the needed configuration and proper performance. When turning to Elastic, we see that you can customize it to your store unique showings, as well as empower with numerous add-ons. Secondly, merchants opt for Elasticsearch to store data logged from multiple sources in one place for the sake of its easier analyzation. Thus, Elastic covers any Magento 2 merchant’s basic needs - it reduces search time and improves the customer experience, thus, has a positive impact on conversions. make your web store faster? Why Is Elastic Search So Efficient? 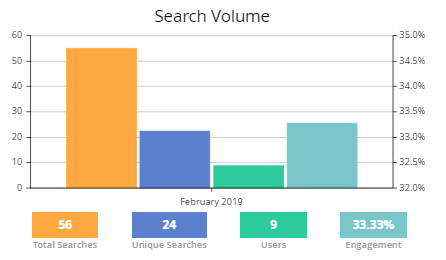 With Magento 2 Elasticsearch, everything is properly indexed - this is one of the reasons why customers receive the most relevant data instantly. Shoppers can use any type of data: structured or unstructured, text or numbers. Let them freely search by SKU, product name, attributes, full and short description, etc. Specify search type and weight for each product attribute individually. Furthermore, your customers can search full text content through any tier as CMS pages and blocks. How does indexing via ElasticSearch work? To ensure logical storing of scattered data and its faster processing, which directly affects your Magento 2 frontend performance, our Elasticsearch uses indexes. What’s more, the indexes come with long-term persistence thanks to the native ‘gateway’ feature of the Elasticsearch engine. Thus, you achieve fast page loading and the option to recover all the indexes exactly from the gateway in case of a server technical problems or even crash. 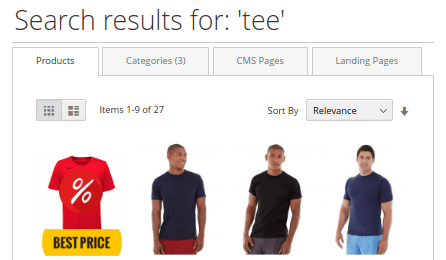 Since all centers around the customers with their longing to find something special, ElasticSearch for Magento 2 takes a search in e-commerce with all the seriousness it deserves. Based on powerful ElasticSearch engine, the extension copes with the variety of shoppers appetites to respond with accuracy that will impress them, and naturally smooth their experience. Present more relevant time-saving search results with advanced autocomplete window. And employ a wildcard partial search to make the shoppers' experience even easier. This is how it works. Specify the error tolerance to prevent confusions which may accidentally happen when shoppers type their requests. Avoid no search results pages caused by typos or misspellings. Add alternative product names to build your dictionary of synonyms, concerning your catalog. Make sure that customers will find things they need regardless of how they call them. Let your customers search through all the content of your web store. The extension returns the full text results within CMS pages and blocks. The integration with feature-rich Improved Layered Navigation and other Amasty extensions will notably improve the shoppers browsing. The settings allow you to specify the search types for each product attribute - SKU, name, description. Configure query to allow a search with autosuggestion or spell autocorrection. For each product attribute, you can specify how the keywords will be combined. E.g., AND provides a search for cases when all the requested words occur altogether. The engagement statistics includes page jumps to Brands, Categories, Blog, CMS & Landing pages. Also, you have the ability to monitor customers' recent activity and the most wanted search terms. Run marketing campaigns to promote certain products by boosting or lowering their relevance score in the search results. 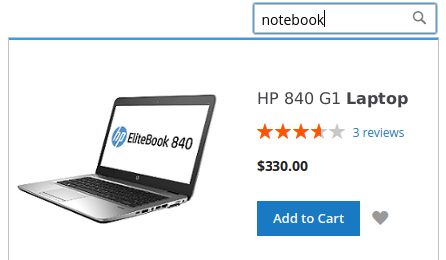 Using conditions with product attributes, return promo products in the top of the results. Your customers will get more precise results, when you specify search weight for product attributes. This will be implemented in the search algorithm. In the search pop-up, there is a handy section with links to the categories, brand, blog, CMS and landing pages that contain search results. Display clickable popular and recent searches to let your customers be aware of trends and worth-while products. Benefit from the multilingual support allowing your visitors to search in their native language. The pre-installed sets of stopwords in 18 languages. The module moves the out-of-stock items to the end of the search results, thus offering the available variants first. It is especially convenient when customers input compound queries that contain hyphens, slashes or any other non-alphabetic symbols. The feature provides precise results when the customers search by SKU, MPN (manufacturer part numbers), or product names with symbols. With the fallback feature, return alternative variants, when there are 0 found items. Offer your customers other similar products automatically. For shoppers, browsing may be time-consuming and somewhat annoying. This may result in their leaving and no conversions. 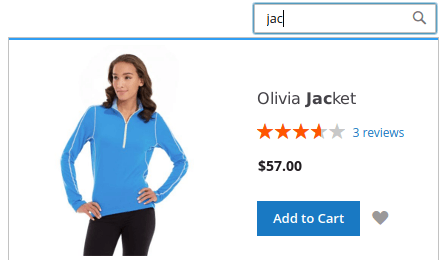 Elastic Search combining with AJAX Layered Navigation, that significantly extends search results page, will help customers to reach what they are looking for in no time. After installation of Elastic Search extension the search in my site gives no results. 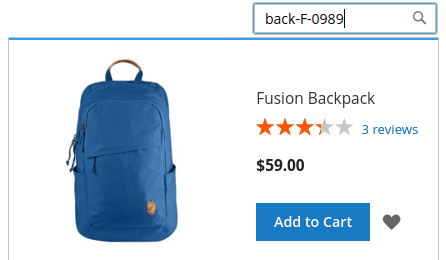 What is the difference between Elastic Search and Advanced Search extensions for Magento 2? If compared we can say that Advanced Search extension is a part of Elastic Search that deals mainly with modifying the autocomplete popup by adding various product attributes to it and making it more user friendly. It also modified the search result page by adding separate tabs for products, categories, CMS and other entities. Read the full answer to learn more details. Our support team stands ready to assist you in installing Magento 2 Elasticsearch engine on the server and configuring it for smooth search experience. We are ready to help and answer all your questions. We included quick and sharp on-site search based on Elasticsearch returning relevant results. It significantly speeds up your catalog layered navigation and works with an unlimited number of products. Steadily analyzing the needs of live Magento web shops together with our own 9-year experience in e-commerce, we believe to provide solutions and deliver functionality that really matters to our customers. I buy their products from the very start of my business for 7 years already. I want to comment the job of the support team, when my devs write them Amasty responds the same hour. First was hard to learn how it works but now im good with it. Most difficult was advanced query. I studied user guide and wanted to check what will be if i set all attributes 10 for importance. Couldn’t do it. I tried to see it on demo, but that was not possible. I changed setting but couldnt see how it works in front end. Or could not find button. Anyway demo must be biger or more intuitive. 5 stars so far I am still fairly new to using it but if offers the search features I need for a large catalogue. The questions I asked after purchase were answered quickly and competently. Would definitely recommend. Great app to help customers find the best products for them. I am experiencing some issues with config, however support is very helpful. Easy to use and run perfectly without bugs. We're using this extension without any issues. Most of all i like search autocomplete and super fast search results with products, categories and pages. I recommend this extension. I was looking for an extension to connect the Magento and Elastic Search and found this one by Amasty. I also had other plugins from this company. The extension works very well and I was able to setup it very easily. I had a small issue and contacted the support. They solved the issue within 1 day. Very suggested. Thanks a lot! Customers like to use the search. Using Elastic Search plugin they get very relevant results compared to the default search done by mysql. Installation and Configuration works without any problems. Very much recommend this module for all shops. Thanks to the Amasty team! A must have improvement of the default search functionality of Magento. Fully compatible with Improved Layered Navigation and other Amasty extensions. Thanks again to the Amasty team for such a great module and the best customer service! Cool thing, more and more custoomers are coming. And conversions are ok. I use also other products by amasty, such as seo smth. These 2 together are great because now I optimize for google and use same keywords to name products in store. So customers come and they see what they expect. And eventually buy. I recommend this ext. This mpdule helped me much and still helping. Most I like that it works with mobile perfectly, most of my clients prefer mobile search. Also longtail search is a great addon. I was surprised that clients actually use - and feel bad when such searches give no results. That sorted out already. All in all, this app works wonders. It;s fast and my buyes don’t leave cause of long page loading. I love autocomplete feature cz it saves time. Specially as they don’t always know what exactly they need. Only small problem is that out of stock goods emerged also there among search results. So some buyers thought they can order when they couldn't till we fixed it. – Fix: the issue on magento commerce cloud with required writing permissions for the file system was resolved.